No steep hills, or we don't think so. From Khao Phra Soi 1 road, it's straight down to Fisherman's Village night life and day time pleasures. On route to beaches around the north east coast, we are located in the no.1 area of Koh Samui. 4. No aeroplane noise and 15 minutes from the airport. 5. Huge living spaces, and fine sized bedrooms all with on-suite bathrooms. 6. They tell us they feel right at home from the minute they arrive. Now for some details of what is on offer: this information will be updated as we add more great features. Ah, and a note: we are in a real gated community, with security and automatic barrier gate. 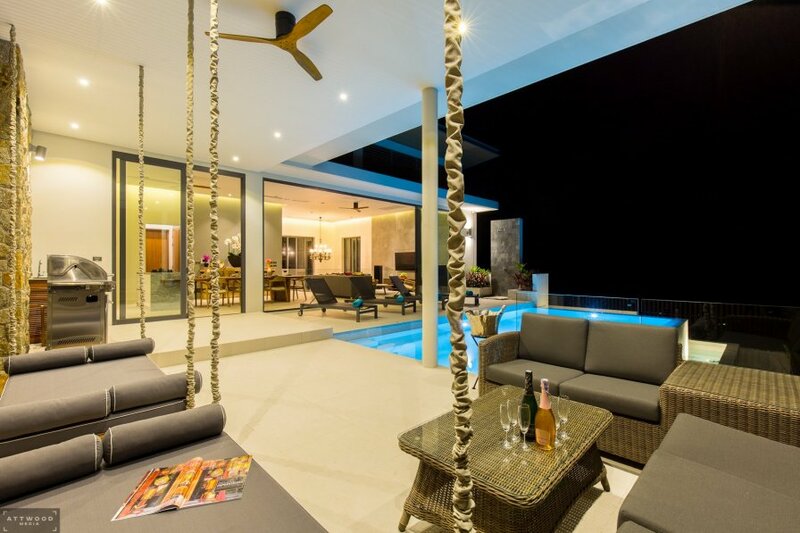 All villas are designed to be different, some owners live in here full time. WIFI internet throughout. All the latest tv movies in every room. Netflix and UBTV in all bedrooms. Laundry cleaned to hotel standard before arrival. House cleaning 2 x per week, Beach towels, and bath towels. Soap, water and other amenities are provided as a welcome gift upon check-in. Our villa is a spacious 5 bedroom home. Large living spaces and kitchen dining facilities with BBQ Gas type. Relax areas with sun-beds, and formal seating by the infinity swimming pool with Jacuzzi jets. You just can't fail to enjoy these magnificent surroundings. The living room comes fully furnished including a 65 inch LED TV, and separate music system and Playstation. There is lovely seating, 2 sofas, chairs suitable for more than 8 persons. The fully equipped kitchen and the dining area can cater comfortably for 8 to 10 persons. 4 bedroom suites on ground floor, all with on-suite bathrooms, master with bath. 1 bedrooms on the upper floor, an equally large one with on-suite. 1 additional floor mattress can be placed in any of the bedrooms as required. Your private terrace area has infinity swimming pool jets. There is a wonderful sofa seating area for reading & relaxation. There is a BBQ for parties with bar table and stools. Extra cleaning is available on request at 2000 Thai Baht per time + cost of laundry.